Artemis is an ideal solution for a two person domestic patio or balcony space. It is also perfect for the centre of a table. With two heat settings 1200w & 2400w. 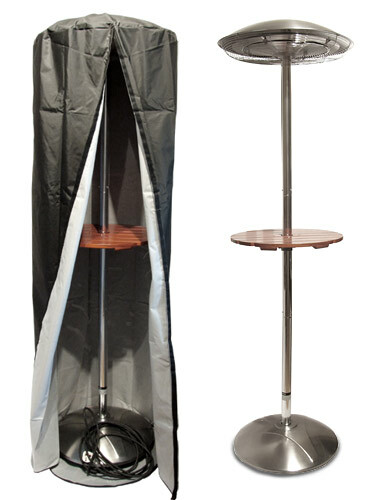 Artemis comes with an adjustable table and a weatherproof cover to protect Artemis from the Weather. Artemis has two carbon fibre heating tubes with a total power of 2400w which significantly reduce running costs by more than 80% and cuts carbon dioxide emissions by at least 80% compared with gas patio heaters. Also available in stunning Silver finish. Instant heat with two heat settings - 1200W / 2400W. Infrared Electric heaters offer more focused heat, heating people rather than the air and emit zero CO2 exhaust gases unlike gas patio heaters. Infrared carbon fibre heating is used worldwide in hospitals for many problems as it is proven to be the most natural, versatile, and healthy form of heat known to man. Infrared heat helps maintain body vitality and increases metabolic function without side effects . Artemis features a sturdy base with built in lockable rollers for easy mobility around patio areas. Should the heater be accidentally knocked over it will automatically shut down and will not operate until it is restored to it's upright position and reset. The table can easily adjusted using the included Allen key for seated or standing persons.